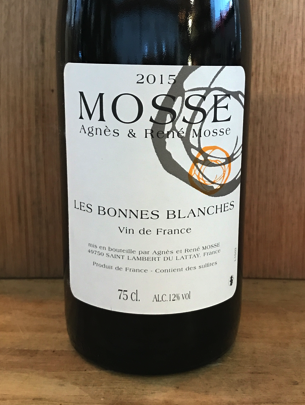 2015 Domaine Mosse 'Les Bonnes Blanches' Chenin Blanc. Loire Valley-FRANCE. "Rene Mosse didn't bother to submit his Bonnes Blanches to the authorities again this year. He knows his wine is good and he knows it will sell so he doesn't need the appellation. He therefore has released it as a Vin de France as so many winemakers are doing these days. Like the Le Rouchefer it is a white wine made from 100% Chenin Blanc. The vines are from a 2.5 hectare plot where the vines are over 35 years old and the yield is very low at only 20 hectolitres per hectare. The wine is aged in wooden fûts. Grapes are picked by hand on this domaine. This is a very good food wine. The alcohol percentage is 13.5 and there is a very small amount of residual sugar while still finishing dry.